The four friends were never able to describe the stranger to the police; the killer's trail went cold. Emily’s mother curses the surviving girls, telling them that if they can’t find the murder, they have to atone for what they’ve done, in a way she’ll accept; otherwise, she will have her revenge on them. Fifteen years later, with the statute of limitations running out, each survivor relates the consequences of that warning for herself. All these fully fleshed-out characters have suffered since Emily’s death, each in her own way. 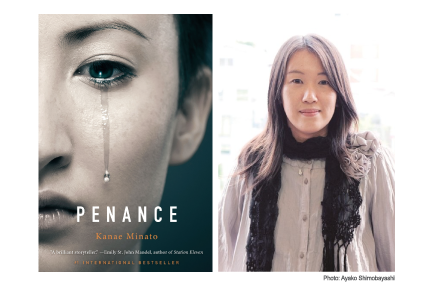 Kanae Minato is an award winning, internationally bestselling novelist and former home economics teacher/housewife whose first novel, Confessions, was a Booklist best crime novel of the year, as well as a finalist for the Shirley Jackson Award for Best Novel and winner of the ALA Alex Award. It was also adapted into an Academy Award–nominated film directed by Tetsuya Nakashima. Minato lives in Japan.